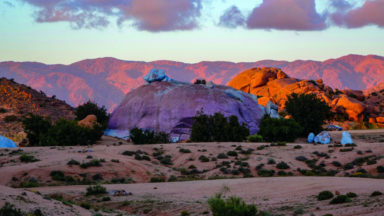 Guidebook to 41 graded walks and scrambles in the Anti-Atlas mountains of southern Morocco. 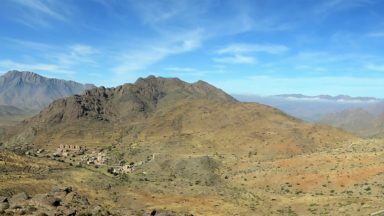 Routes from 3 to 25km, including a summary of a 1-week long-distance trail from the north to the south of the Anti-Atlas. Covers 6 main areas, including Tafraout, Jebel El Kest, Ait Mansour, Ameln Valley, Taskra and Tanalt. October through April with hotter periods moderated by altitude, low humidity and a frequent light breeze. Weather events can sometimes bring cold conditions and snow on the summits especially in mid-winter. 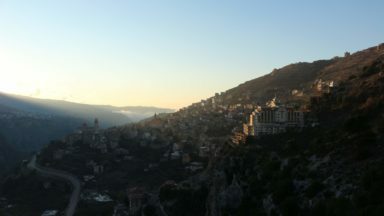 Tafraout and the Ameln Valley are the major bases with the Kasbah Tizourgane at Ida Ougnidif providing a shorter-stay option. The routes best suit confident walkers and scramblers with a sense of adventure. Walks range from easy (2hr) to very difficult (13hr) explorations. Easy and moderate options require basic fitness and route-finding ability. The graded scrambles (1 to 3S) should appeal mainly to experienced scramblers. 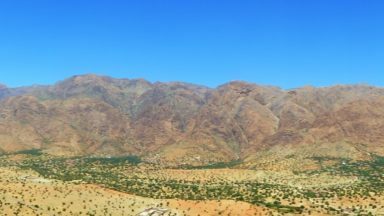 The mountains of Jebel El Kest (2375m) and Adrar Mqorn (2344m) which dominate Tafraout, the strange eroded and weathered rock formations, the deep gorges of Ait Mansour and the skyline rim, the springtime flowers of the Tizi N'Takoucht escarpment, the Ameln Valley villages and the elusive Adad Medni. Page 31: Time Zone in October 2018 Morocco suddenly announced that it was discontinuing the daylight saving adjustment and it will remain on GMT + 0 in line with western Mediterranean countries. Appendix C p276 : Ait Baha- Hotel Aladarissa email address 'contact@hotelaldarissa.com' no longer works and is replaced by 'aladarissahotel@gmail.com'. Page 277 Under important telephone numbers: Additional Police Telephone number for the north part of the area above Ida Ougnidif is covered by Ait Baha Police (+212(0)528254355). This covers the One Week trek stages 1&2 and routes 30,31,33 and 34. A nice, well researched guide to hiking and mountain adventures in this wonderful part of North Africa. I have a couple of other guidebooks to Morocco as it’s finally edging itself up the list of places to visit for a trip in 2019 or early 2020 so the arrival of the new and updated Cicerone guide came as a welcome addition to my The High Atlas: Treks and Climbs and Morocco Rock. On top of those two the you might find the Lonely Planet guide and other useful addition if you are intending to explore the country after your mountain adventures. That said there is more than enough useful information in Walks and Scrambles in the Moroccan Anti-Atlas to plan a trip to the area and the area is well served with mobile signal so you should be able to supplement the guide with Google. The information David Wood provides in the guide is informative and very useful with being overly complicated and unnecessary, just enough to get what you need. There is plenty of informative advice on when to go, how to get there and how to enter the country. 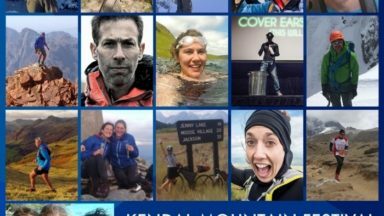 On top of that there are chapters covering geology, politics, culture, climate and a good section covering the basics needed to enjoys a holiday scrambling and travelling through the mountain environment. All very useful stuff that doesn’t crowd out the main content of describing the routes. Routes are described in geographical locations and each village has a detailed map showing where important places are such as the pharmacy, medical centre, etc. Each area has a great selection of routes at all grades (grades are explained in detail in the introduction section) and abilities from simple walks with easy summits to complicated and long days out with scrambles that will test you. They are all described in detail with where to park, a general description and then a detailed description and map. The description also notes what detailed map is needed for the activity and it must be stated that although the maps provided are reasonable they are no substitute for a detailed topo map and a compass. Much care is used to describe descents and this alone marks out David’s knowledge of the routes and the area as in other guidebooks I’ve used they are often sketchy. There are also plenty of good quality photos to keep you inspired. The Walks and Scrambles in the Moroccan Anti-Atlas is a useful guide to planning and enjoying your hiking adventures in this amazing and varied country. I’m currently planning a big Moroccan trip which involves hiking, scrambling, bouldering and general travel so David Wood's Guide is proving extremely useful as the information is bang up to date and the guide is small enough to pack in my very small hand luggage. I won’t hesitate to take it with me and use it as an in country source of reference. 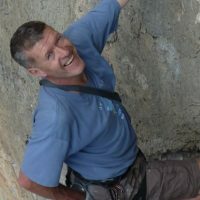 ​Based in West Lancashire, David is a keen walker, photographer and rock climber. As a frequent traveller he has followed his pursuits in over twenty countries across five continents.